If you require accessibility information, please call the venue directly on 0800 912 6973. No refunds or exchanges available after purchase. Wicked stars Alice Fearn (Elphaba), Sophie Evans (Glinda), David Witts (Fiyero), Melanie La Barrie (Madame Morrible), Andy Hockley (The Wizard), Chris Jarman (Doctor Dillamond), Rosa O'Reilly (Nessarose), Jack Lansbury (Boq), Laura Pick (Standby for Elphaba) and Carina Gillespie (Standby for Glinda). E-ticket (print at home) or collect from the venue. 2 hours 45 minutes, including one 20 minute interval. WICKED is suitable for a general audience and contains no profanities. As a guide to parents, guardians and teachers, it is recommended for ages 7+. All persons aged 16 and under must be accompanied by an adult and may not sit on their own within the auditorium. Children under 3 years of age will not be admitted. Wicked The Musical is loosely based on the novel of the same name written by Gregory Maguire. The musical tells the story of the two witches who will become Glinda the Good and the Wicked Witch of the West. In this subversive retelling of the familiar story of Oz, the green-skinned Elphaba is a well-meaning outcast just trying to do the right thing, while the extroverted Glinda is just trying to be popular. The two meet in school, where their relationship and their lives take a number of startling turns. 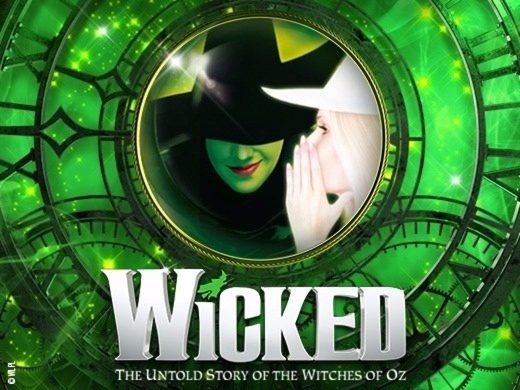 Wicked The Musical has won numerous awards, including an Olivier Award for Most Popular Show, two Olivier Audience Awards and three WhatsOnStage Awards for ‘Best West End Show’.